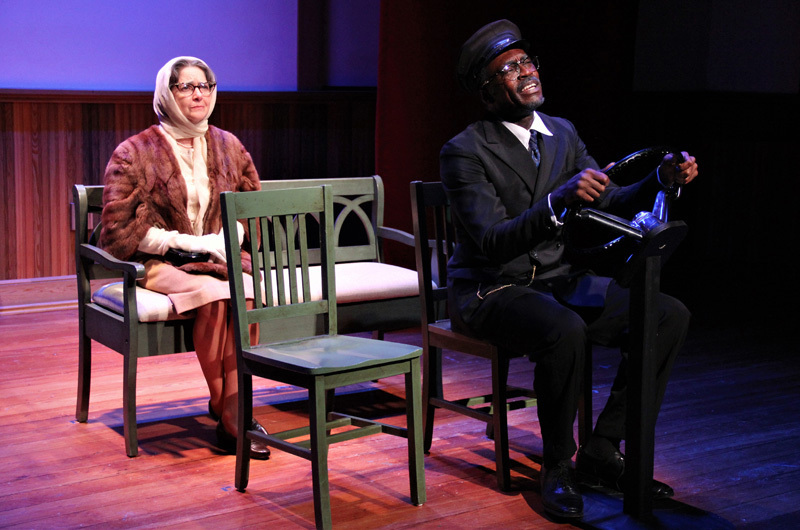 Playhouse hosted production of Driving Miss Daisy last year. Tisbury assessors are standing by a decision to deny tax-exempt status to the Martha’s Vineyard Playhouse for the first time in its 36 years, saying the theatre’s mission does not meet the legal definition of a “benevolent” use. As a result of the vote, which took place in July, when town property tax bills go out sometime before the end of the year, the playhouse will be liable to pay some $7,800 in taxes on an assessed valuation of roughly $875,000 a year on its Church street theatre facility. Leaders at the nonprofit playhouse have vowed to appeal the decision, saying the vote by assessors was arbitrary and unexpected and will cause financial hardship. “They seem to be looking for reasons to show that we are not a charitable organization,” said playhouse board president Arnie Reisman. The theatre has been operating under a 501c3 tax-exempt status with the town and the state since 1982 and has not been subject to property tax since taking ownership of its facility in 1993. “We have canvassed Massachusetts and can find no other theatre being taxed like this. We struggle to make our annual budget, and this tax will inflict a large burden on us,” wrote playhouse treasurer Gerald Yukevich in a letter to the editor that is published in today’s edition. But assessors said the decision came as part of a top-to-bottom review of all tax-exempt organizations in town — including the playhouse — that began late last year. In addition to the playhouse, at least four other charitable organizations were also put back on the Tisbury town tax rolls this summer: Hospice of Martha’s Vineyard, Sail Martha’s Vineyard, the Vineyard Montessori School and the MV Center for Living, records show. Those organizations lost their tax exempt status because they did not respond to a request for information that went out in December 2017 with a required response date of March 1, 2018, assessors said. The playhouse did respond to the request for information but later was denied status on the merits, assistant assessor Ann Marie Cywinski told the Gazette. “The board of assessors reviewed the [playhouse] application on July 11 and determined they no longer qualify for the exemption because they don’t meet the benevolent piece of the mission,” she said. “One of the criteria for benevolence is — is it for education or providing a service the government can’t provide? They have an education program in theatre and we wanted details of all that . . . but they couldn’t give us the details. Their mission statement says their primary objective is to promote live theatre productions. I couldn’t find anything in the statute that said live theatre was a benevolent use,” she said. Angela Cywinski, who is an elected member of the Tisbury board of assessors, is related by marriage to Ann Marie Cywinski. She is also an assistant assessor herself, for the town of Aquinnah. The playhouse was informed of the July 11 decision in a letter from the assessors dated Sept. 25. “Nonprofit status is not sufficient . . . The organization must be organized for charitable purposes and must actually operate as a public charity. Its dominant purposes and activities must benefit the public at large, not just a limited group of people,” the letter said in part. Playhouse executive director MJ Munafo responded with an email asking to meet with the assessors, but was told there is no recourse except to go through the formal appeal process. Ann Marie Cywinski said this week that once the playhouse receives its tax bill, it can appeal the decision no later than Feb. 1, 2019, at 4:30 p.m.
Angela Cywinski said the playhouse has the option to appeal directly to the state appellate tax board if it chooses. The chairman of the assessors also said she is not without compassion for the playhouse but is bound to follow the law. By contrast, Ms. Cywinski said Richard Paradise at the Martha’s Vineyard Film Society went out of his way to provide the assessors with documentation. “I was bordering on a vote to deny [the film society]. . . but he brought in information and that changed my mind. He was very in tune with the process,” she said. The assessor’s office, asked by Gazette under a public records request for all relevant meeting minutes for the past year, provided some but not all, saying some were incomplete or still in draft form. Available minutes and email correspondence provided by the assessors show that on Dec. 8, 2017, a letter went out by email to some 31 tax-exempt organizations. “This year the board of assessors will be doing a compliance with each of our exempt organizations for auditing reasons . . . we will be requesting additional documentation from everyone,” the email said in part. Between May and July 2018, the assessors engaged in extra scrutiny of some 34 tax-exempt organizations in town, available minutes show. Most were granted tax-exempt status, but some were not. Angela Cywinski acknowledged the problems with the minutes and said she had been informed by the town administrator that the board should change the way it keeps its meeting records. Meanwhile, Mr. Reisman said the playhouse will appeal the ruling and had learned its own lessons from the experience. I love theater and think the MV Playhouse provides a wonderful experience for all who can attend. However, as a parent, and thankfully not one in Vineyard Haven, I appreciate what the assessors are doing here. If the town can't afford to fix an elementary school that is completely broken physically, or reward the students and underpaid staff with a clean safe building, then I'd say Vineyard Haven residents should object to their tax dollars going to something primarily seasonal and an indulgence for "seasonal residents". The assessors gave every exempt organization an opportunity to show their charitable worth, under the law. Many made the effort, knowing that an exemption from property taxes is an exception under the law that must be proven. The burden is on them. It is not an entitlement. Some non-profit boards, blissfully unaware of the legal standard and not really concerned when reminded (something the town should never have to do), failed to meet the test. The words of the the Playhouse leader touting their contribution to the business community in recent letters and interviews seals their fate, as does the less than 1% of budget that goes into education. They can remain a charity under IRS rules (much weaker than Massachusetts laws regarding property tax exemptions), their contributors can collect their federal tax breaks, and they can drop the paltry token education spending and pay their taxes with that money. It works out even. Or they can change their mission and perhaps become a genuine exempt from property tax institution by providing what the state and town aren't. Meanwhile, kids who will never get these years back are learning in a crummy building from inspired but frustrated teachers. The Playhouse experience is great, but they need to pay their own way. My goodness, the CPA funds alone from town tax payers were more than decades worth of taxes. The Playhouse leadership needs to learn what makes an organization exempt from property taxes, do it, prove it, not expect the underfunded town to provide them with tax advice, or quit claiming the exemption and pay their taxes like the rest of us. Massachusetts law is quite clear to every lawyer we've spoken with. To be tax-exempt, "Personal property of a charitable organization, which term, as used in this clause, shall mean (1) a literary, benevolent, charitable or scientific institution or temperance society incorporated in the commonwealth..." Everyone apparently but Tisbury assessors sees "literary" as an all-purpose umbrella covering the arts. In short, the Playhouse is a nonprofit literary as well as charitable institution. It has been judged so by every Tisbury assessor group since 1993. Suddenly, the Playhouse no longer fits the state definition. The law didn't change. The assessors did. There is no other theater in Massachusetts that has been removed from its tax-exempt status. All we are asking for is fairness and justice. The Playhouse is a community resource that contributes greatly to the lifeblood of Tisbury and the island. Mr. Reisman, I really do appreciate the work you do and the work your organization does. I do think the playhouse should talk to an attorney before responding further...as in get one pro bono or paid. You just quoted a bit of law that references personal property. From what I read, you are being assessed for real estate. These are two totally different animals. This is an emotional issue, and the sooner you set emotions aside, learn the rules and defend your position within that context, the more likely you are to succeed. I have no horse in this race. I do hope all parties recognize their obligations towards the public, taxpayers and theater goers, based on law and ethics. I understand both sides here. Hopefully everybody here reads up and walks in the shoes of others. Your time would be better spent preparing your appeal and the documents and proof they are requesting than trying your case in the court of public opinion. The same section of law quoted by Mr. Reisman does also apply to real property. The part he quotes provides the language for defining "charitable organization"; later in the same paragraph it says the real property of a "charitable organization" is also exempt. see MGL Chpater 59 Section 5. Seriously Hospice... They're definitely in it for the money...please have some common sense. Exactly, would love to know the reasoning behind that decision??? The’re going to tax Hospice of martha’s Vineyard? An entity that provides free end of life nursing services? How much more of a charity do you have to be to qualify as a charity???? That’s sickening. Every single member of the public will need these services. By definition, people who need charity are not all members of the general population, they are people in need. Sometimes it’s children. Are they saying that UNICEF isn’t a charity because it only benefits children?? If I can deduct my donation, then it’s a charity. Taxing a Hospice??? Wow, that’s really scraping the barrel! I understand that the assessors are looking for money, but this is nuts. I support the playhouse and know all the educational activities they provide for island children and families, year round. The plays might run primarily in the summers, but the theatre instruction for schoolchildren is important for the school year. Boo on taxing Vineyard Playhouse they’re a year round asset to the community young and old. Taxing them could kill them - shame And the Hospice? That’s just insane. Presenting live theatre makes you a literary institution! While I agree that this sounds harsh, please consider the following line in the article: "Those organizations lost their tax exempt status because they did not respond to a request for information that went out in December 2017 with a required response date of March 1, 2018, assessors said." Failure to adhere to an RFI in a timely manner caused this, not a greedy or cruel town government. There will now be an appeal process, and this anger/disappointment of these four organizations can be directed towards compliance with a request and ultimate re-granting of their tax exempt status. And, the assessors waited until the end of September to notify these organizations about a decision made in July. That's timely? Minutes aren't complete and accessible. Administrative follow-through seems to have taken a back-seat to the pursuit of causing strife just "because we can". The Play House I understand. I've never been able to afford it. But Hospice? No justification whatsoever! I was shocked to read that the MV Center for Living lost its tax exempt status. Has any member of the Board of Assessors ever spent an hour at the MV Center for Living? It serves the year-round island-wide community of people suffering from dementia and other cognitive problems with an adult day care program four days a week and a music program, staffed largely by volunteers on Thursdays for people with cognitive and physical disabilities. As I understand the finances of the MV Center for Living, it is supported by each of the island towns. I don’t know if they missed the March 1 deadline but some flexibility and compassion is needed here! Vineyard Playhouse provides island kids with a lot of great experiences. So does Sail MV at a laughably low fee -- sailing and rowing for island kids for the cost of a membership! What could possibly be more appropriate for island kids to do? Every kid should learn to row and safely enjoy the waters, as well as learn skills of basic seamanship. Hospice provides ALL of us with end of life options for a dignified end and it does not charge. So the VH assessors are going to make them pay taxes...what a bunch of truly stupid and heartless decisions........decisions with absolutely no justification. It sounds as if the Assessors obfuscated so that the organizations would have problems. This is a shocking, arbitrary and capricious decision by Ms. Cywinski and her colleagues. It seems as if they were looking for more money, and they found a way to seize it by upending decades of Island and state-wide tax practice, and without reasonable due process or fairness. The Playhouse, for example, has operated as a charitable organization for three decades and in a manner consistent with Massachusetts charitable tax law. My children have benefited tremendously from programs run for all Islanders over many years. Do the tex assessors remember the Fabulists on Saturday morning or Shakespearean plays performed in the same space in high season in the early evening? Our Island is so lucky to have a quality organization such as the Playhouse. Even as a charitable organization, the Playhouse is very difficult to maintain, Why weaken it with this surprise and unjustified attack? This decision calls out for an immediate review and reversal. And the Hospice decision seems totally wrong, too. The Martha's Vineyard Playhouse has done nothing but served, and continue to serve, our island community and those who join our island community in the summer time. I have been with the Playhouse since I was 8 years old, starting my theatrical studies at Summer Stars Theatre Arts Camp. While our family couldn't afford the full tuition price of camp, MJ Munafo provided scholarships for my attendance to the camp out of the sheer importance of getting the children of our island community involved in theatre, regardless of cost. MJ has done this for myself and SO MANY other children through the years of the camp's life, serving the community to foster practice and appreciation of the arts. I continued to attend the camp for years after, subsequently working at the camp when I was 15 and 16, and now I am extremely proud to say that I am the Camp Director for Summer Stars. Summer Stars and the productions that I have been a part of at the Playhouse, from mainstage holiday shows, to Shakespeares at the Tisbury amphitheater, have defined my career path for my life, and I am now a senior Theatre major at the University of Vermont, and will be graduating in May. Without the playhouse and it's never-ending generosity and dedication to enriching our community with the arts, I would not be where I am today, excited about my studies and theatrical projects, and looking toward my future with the Playhouse, the island, and beyond the shores of our community. The condemnation of an organization that provides the community with high-quality art, both visual and performative, is a disgrace to our community and the arts as a whole. The arts are what make us human, and remind us of that humanity in times of comfort and trial. The Martha's Vineyard Playhouse is a huge asset to the island, one that is in symbiotic reciprocity with our community. We need the community and the community needs us. Without an audience, there is no theatre. I think there’s a culture war going on in Tisbury. From the defeat of the new school to the behavior of the police department to replacing the town hall tower with an aluminum facsimile to this. Yes summer people use the playhouse but they also pay taxes on some of the most expensive things property in town and don’t send their kids the school here and only make use of other services 3 or 4 months a year. The playhouse is an institution and brings people into town for dinner and shopping. My daughter has been in education programs at the playhouse and it’s helped her tremendously. They offer their lobby to artists and play films. I find this assessment more about the battle between different views of the town. I'm a neighbor, one town over. And glad I am. Because if Tisbury can't see that the playhouse provides a benevolent use to the Island/town then it proves why a new school can't be built nor a new Stop & Shop. Ship of fools comes to mind. Dear Tisbury Assessor: “Do job.” “Meet number.” “Balance ledger.” “Tough love.” "Letter of the Law." All these are “push hard, dig in and let the chips fall” techniques to taxation. Instead, as I’m sure may have considered, small town tax assessment is in essence communitarian, and with your job you have the power, even the responsibility, to positively impact economy and community. You might try the following. During your morning coffee tomorrow think about how you might replace tough love with a broad, (spirit of the law), communitarian approach to taxation. When you do I bet you’ll see 1) there are near and long term tax and budget projections which will enable you to meet your goals, 2) these community-focused organizations deserve an easy opportunity to prove their charitable status — and 3) your coffee will taste better. well said Mr. Phillips !! I believe this action by the Tisbury Board of Assessors highlights a larger issue that exists island-wide: the three down-island towns bear the greater burden of tax-exempt properties who provide services to the entire island population. Some of these services are critical and essential, others fall into the category of feeding our soul. However, it's time to recognize the debt that up-island owes to its down-island neighbors. I don't have a solution to offer, but we at least need to acknowledge that the burden is not fairly shared. From the comments here it seems that few people read Gazette articles carefully. We all love these organizations and their services. There's no doubt that they all add to our community on the Island. But the organizations that didn't provide requested information were denied the exemption. The Theatre included (regarding their educational program). Fair is fair. These organizations can appeal, or even ask to change the law if they so desire. Next time, Mr. Reisman might want to invest his energy in timely responses to requests from the Town instead of researching the law. The Film Society "went out of their way to cooperate" - and kept their exempt status. You confirm it.....sadly, Tisbury deserves its reputation. And it wasn't hard to earn.